Not going to be much of a post today. I have apparently joined the latest flu craze, which is called H1N1. Commonly known as swine flu. A very intense flu bug, too. I can barely lift my head right now, much less write an article. And I did have a special topic all ready for you. Guess it'll have to hold off until next week. I'm taking something called Tamiflu, and my Doctor swears by it. So far it hasn't accomplished very much. I will be patient, however. What else do I have to do with my time? Here is an article about this flu, just in case you find yourself so afflicted sometime soon. H1N1 flu strain has returned with a vengeance (SF Gate.com link) - When the state released its most recent report Friday on the flu situation in California, one number stood out as particularly alarming: 95 deaths. That's the total of deaths reported to the state since the flu season started in October. By this time last year, only nine deaths had been blamed on the flu. But this season may not be as deadly as the report would have people believe, public health experts say. As striking as 95 deaths might seem, that number is just one piece of a larger flu puzzle that's complicated and still largely unsolved. "This year seems to be shaping up to be a more severe flu season, but until it's over we're not going to know how much more severe," said Dr. Cora Hoover, director of communicable disease control and prevention for the San Francisco Public Health Department. "If we just look at deaths, that's really the tip of the iceberg," she said. "Most of the iceberg is illness that is disruptive and keeps people away from normal activities for a few days, but it's not, thank goodness, life-changing." 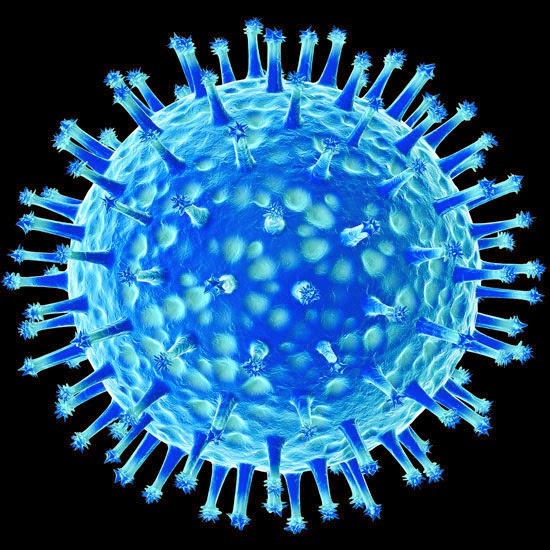 The main virus in circulation is a strain of influenza known as Type A, subtype H1N1 - known informally as the swine flu. It's the same strain that caused the 2009 outbreak that began in Mexico in April that year and swept around the globe in just a few months. The biggest mystery about the current flu season may be why H1N1 has resurfaced. It's been circulating every year since 2009, but other strains have been dominating until this year. No one knows why H1N1 is surging now. The strain is known to target people younger than 65, which is why the death toll for this year seems unusually high - California only collects data on flu deaths in that younger population. Older people are usually much more susceptible to the flu, and tracking their deaths would be a monumental, and expensive, task. Because the state doesn't keep strict records on total deaths from the flu, it's impossible to say whether this season is more or less deadly than any other season. In fact, records of deaths in adults under 65 only go back two years - the state began requiring counties to report those cases in 2011 - so no one can say just how bad a season this is even for middle-aged or young adults. Statewide, outpatient visits and hospitalizations for the flu are higher than usual for this time of year, although that may be because the season is starting, and peaking, earlier than usual. In last week's state flu report, outpatient visits fell slightly from the previous week - possibly the first sign that the season has peaked, said Dr. Gil Chavez, deputy director of the Center for Infectious Diseases with the California Department of Public Health. Even so, the state's looking at another several weeks of flu activity, and it's not unusual for a second, smaller wave of flu - often from a Type B strain of the virus - to hit in March or even April. You might want to get yourself a vaccine. It is becoming fairly obvious that City Hall has only one priority these days, and that is laying their hands on more of your tax dough. It is just about the only thing they do these days. The water rate hike has now been safely tucked away, and next in view is an eight year extension of Sierra Madre's utility taxes. Which, as we know, are among the very highest in all of California. We truly are a natural wonder in the Golden State. None pay more than us, even after we voted ourselves some utility tax relief in 2012. Something that has since been completely disregarded by most of our elected and salaried officials. Our votes only count when these stalwart defenders of local democracy approve of the results. The assumption downtown apparently is that we did this in a moment of childlike choler, and it is their duty to bring us back to more responsible ways. The terrible mistake of not voting to pay 10% utility taxes to City Hall being completely ignored by those who live off of that largesse. For our benefit a helpful do-over vote has now been arranged for us on April 8. Our blithe and chipper City Council, who for some reason seems to be at its very merriest when they are dunning the residents in a monetary sort of way, has now blessed us with Measure UUT. An eight year extension of our sky high double digit utility taxes, something that will take us all the way out to the distant year of 2022. Just in case you change your mind. People shouldn't be allowed to vote on taxes too often, you know. And trust me, they're gearing up for this one. So much so that they changed up some water rate hike paperwork at the very last minute Tuesday evening. Done out of a fear that if they didn't it just might threaten their 10% utility tax intake. It was called Urgency Ordinance 1351-U, which is very science fiction sounding. Did you catch it Tuesday evening? Here is how the staff report introduced this move. Summary: Staff recommends that the City Council approve the Raftelis draft Water and Wastewater Rate Study Report of November 13, 2013; read and adopt Urgency Ordinance 1351-U, setting new water and sewer rates, effective March 1, 2014, and read Ordinance 1351 setting new water and sewer rates. All pretty innocent so far. There is that "urgency" thing, though. And what makes this all so very urgent you may ask? Read on. There are unkind details. The attached Urgency Ordinance 1351U established the beginning date for the new rates as of March 13, 2014; Ordinance 1351 establishes the beginning date for the new rates as of March 13, 2014. The March 1, 2014 date for the Urgency Ordinance was selected in order to coincide with the existing billing cycles and ensure that one portion of the community is not billed at the new rates more times than the another. Each of the two bi-monthly billing segments will receive two bills under the proposed FYE 2014 rates. Utter gibberish. Here is where it gets laid on really thick. The information that was mailed to water and sewer customers indicated that the new rates would be effective February 1st; however it was later determined that this would result in an inequality in the billing cycles for both segments of the community. Which is, of course, also nonsense. If all the water bills needed to get out to all of the customers at the same time, what you'd need to do is mail them all on the same day. Any individual billing adjustments deemed necessary could have been done the old fashioned way, by fixing the math. It certainly wouldn't have taken delaying a water rate increase for an entire month to accomplish. So why was the date changed from February 1st to March 1st, and in an "urgency ordinance" sort of way no less? City Hall doesn't want you to receive your brand new jumbo-sized water bill before you vote on Measure UUT. This ballot decision takes place on April 8, and that new March 1st date change will ensure that you won't receive your water bill until after you've cast your UUT vote. The City is afraid that you'll be so angry over your new jacked up water bill that you'll go to the polls and take it out on Measure UUT. So it was delayed. They certainly can't allow this UUT rate extension to go down for the second time in two years, right? Of course not. They have pensions to fund. Excerpt of the 10 a.m. ET conference call transcript: "Hi everyone, it’s [Patch COO] Leigh Zarelli Lewis. Patch is being restructured in connection with the creation of the joint venture with Hale Global. Hale Global has decided which Patch employees will receive an offer of employment to move forward in accordance with their vision for Patch and which will not. Unfortunately, your role has been eliminated and you will no longer have a role at Patch and today will be your last day of employment with the company. … Thank you again and best of luck." In other words, these people fired hundreds of Patch employees yesterday by recorded voicemail. You can listen to the bad news by clicking here. It doesn't get any colder than that. Let me ask you this. If the roles were reversed, and those who supported the water rate increase needed to have a lot of people mail in 'Yes' ballots, would they have been able to get over a thousand of them submitted? I very seriously doubt that would happen. What this means is that close to 25% of the Water Company's 4,000 plus customers are so entirely angry with the lousy job being done there that they filled out and signed their names to Prop 218 paperwork, and then mailed it into City Hall. You could take this as an indication that they have not been having a quality customer experience. Or maybe they are just tired of funding this city's constant recoveries from self-inflicted financial disasters. It is also hardly what anyone would call a big vote of confidence. And certainly the taxpayers do not seem to be in the kind of mood conducive to the passage of Measure UUT in April. What over 1,000 protest ballots should tell anyone is that a lot of this community's most aware and likely to vote residents are not very happy right now. Add their family members, people who were not allowed to cast ballots on the water rate hike, and you have quite a few votes. In the 30% voter turnout environment expected for April's City Council election, they will be the majority. I certainly would not want to be a pro-tax City Council candidate in this election. Of course, only a few members of the public showed up last night to this City Council meeting to discuss the water rate matter. Basically because it would have been pointless to do so. After all, if our City government was really interested in the public's opinion about a water rate increase, wouldn't they have put the question on the ballot for this April's election? Something no one there cared to do because they clearly understood that the outcome might not have been as favorable for them. By favorable I mean anything that guarantees significant amounts of money being removed from the public's pockets and given to City Hall. I'm not sure anything else gets taken seriously there anymore. It really is only about money now. It is just about all they do. What Prop 218 assumes is that 100% of the eligible voters are in play, and that enough of them could potentially cast enough "No" ballots through the mail to defeat a water rate increase. However, and as it is in many places, we live in a city where often less than 30% of the folks vote in local elections. Something that makes the level of resident participation needed to win in a case like this almost impossible. In a Prop 218 election, it isn't a majority of voters that wins. It is a majority that includes people who haven't voted in a local election in decades. Plus anyone who is not an officially designated ratepayer is weeded out. The odds by design are obviously stacked in favor of the taxer, and not the taxed. So they got their water rate increase, and all the City Council members warmly thanked the residents for supporting it. Even though each of them must have known that by choosing Proposition 218 as the vehicle to get this water rate increase done, they made the public's ability to express its supposed support far more difficult than if they had put this issue on a ballot. I will assume this means that each of them understood that they were thanking people for something that most likely doesn't even exist. After all, isn't that why they did it this way? More proof that you really do need an advanced degree in Orwell Studies to properly understand City government in this town. This City Council also approved "zoning" for homeless housing in Sierra Madre. With Josh Moran going so far as to claim that nobody would ever build this stuff here because the costs here would be prohibitive. I guess Josh, or anyone else on this City Council for that matter, has never seen websites like this. Or this. Or this. It is state and federal government grant money paradise out there for homeless shelters. Perhaps they did know that, but preferred that you didn't. Maybe it is a secret that only developers should know. And despite the fact that all five Councilmembers ran for office promising to maintain Sierra Madre as a low density town, they all voted to approve a housing element to the General Plan that will open this burgh up to quite a lot of high density infill development over the next eight years. It is all quite predictable, I guess. What else would you expect from a city government that only cares about raising rates, fees and taxes? Is it any wonder that so few have faith in City Hall anymore? Will the Water Rate Increase Succeed at Tonight's City Council Meeting? I would think stopping it is a bit of a long shot at this point. As a wild guess let's say that out of the 977 envelopes received so far 100 contain multiple ballots, and out of those perhaps 20% contain more than two. Throw in a hunch or three, add ice and stir, and we end up with, say, 1,300? Still leaves us a little more than 500 out. A good showing perhaps, and I am certain a lot more than the downtown cash confiscation cabal ever believed would be turned in, but not enough to stop this latest money grab. Of course, had this mess been put to a ballot test and voted on in a properly conducted democratic election, I have no doubt this water rate increase would have gone down in flames. 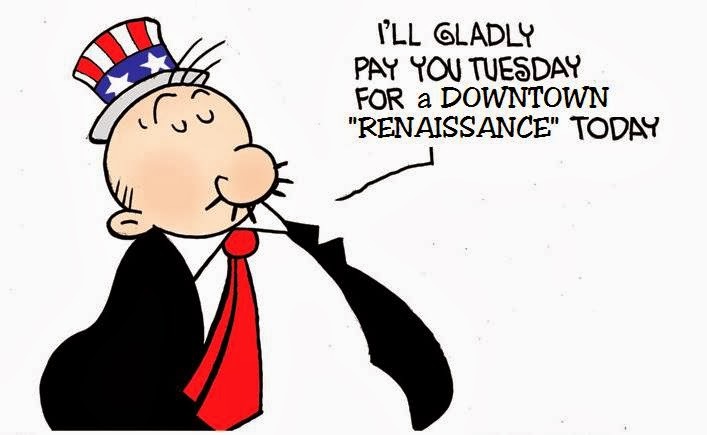 But instead we have Proposition 218, a so-called process that asks ratepayers for a level of sophistication and understanding that many have yet to attain in their lives. It is the appearance of a vote on what some of my friends are calling a water tax, but without any of the usual user friendly aspects. Like simplicity and clarity. What Prop 218 assumes is that 100% of the eligible voters are in play, and that 50% of them (plus 1) could potentially cast "No" (but not "Yes") ballots through the mail and defeat something like this water rate increase. However, and like many places, we live in a city where often less than 30% of the folks vote in a local election. Something that makes the level of resident participation called for in a situation like this one nearly impossible. Besides, if saying nothing was the requirement for paying more for everything in this life, instead of just water and the use of the town sewers, a lot of people would probably starve to death. I am certain that hundreds of ballots were thrown out by residents weeks ago not because they were anxious to pay 61% more for water, but because they assumed that what City Hall had sent them was junk mail. And, based on years of resident experience, baffling junk mail at that. - 82.4% of the call recipients are favorable to our call. That means they are not upset about us calling. - 68.9% of the call recipients identify themselves as property owners. - 78.7% of the call recipients state they have received the protest form. - 78.9% of the call recipients state they already mailed theirs in. - 33.1% of the call recipients request the website address so they can print a form out. Based on these numbers, and assuming that their ballots actually did go out in the mail over the weekend, there could be a surge of Prop 218 envelopes received by City Hall today. I am also going to assume here that messages were also left at residences where the phone was not picked up, so there could be some effect in that was as well. I guess we shall see. At least the odds we're talking about here are better than the ones the state lottery offers. According to the City Manager of our fair city, you can bring your ballot in right up until the public hearing on this item has concluded. As this will be the 2nd item under consideration tonight, I wouldn't get there much past 6:45. I have little doubt that our financially giddy City Council won't want to lay their mitts on the water rate swag bag as quickly as possible. The first public hearing is related to the proposed water and sewer rate increases. I wanted to remind the City Council that the City Clerk and City staff will begin opening protest ballots at 9:00 am on Tuesday, January 28th. Protest ballots can be received up to the close of the evening public hearing. At the evening public hearing, the City Clerk will report the number of protest ballots received, the outcome of which will determine whether the Council can take action on the rate increases. I will try and get updates throughout the day. If I do get any I will update the numbers in the tally box at the top of this page. I will also be "live blogging" from tonight's City Council meeting, so there is that as well. Missing the opportunity to observe certain folks celebrate their golden opportunity to pay 61% more for water, and sending their freshly fattened checks to some of the same people who helped run up $9 or so million dollars in bad debt by making interest only payments on an old water bond, is not something I'd ever want to miss. It will help fortify my increasingly low opinion of human affairs in general. It has been my experience that most people prefer to be told what to do. Those who question local governmental authority are more often than not a minority, and often the cause of some stress to those who'd rather quietly submit to the City's endless requests for things such as more money. Apparently that is somehow preferable to thinking these things through. 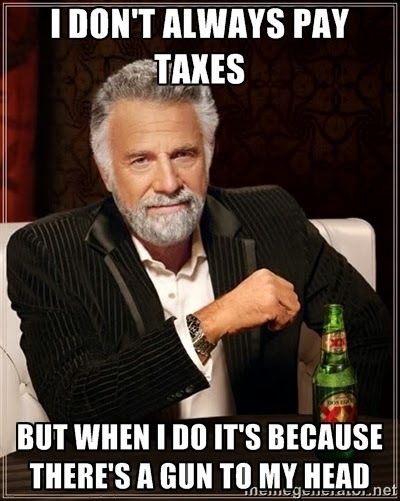 Even when the need for more tax or rate revenue was caused by financial malfeasance, or even plain old incompetence. Which could very well be the case with the water rate increases being demanded in Sierra Madre. Trust me, the people who are orchestrating the attempt to suppress Sierra Madre's Prop 218 protest vote against a massive 61% water rate increase get this. Take the headline in this week's Mountain Views News, our weekly adjudicated newspaper that sadly serves as little more than an extension of our city government. 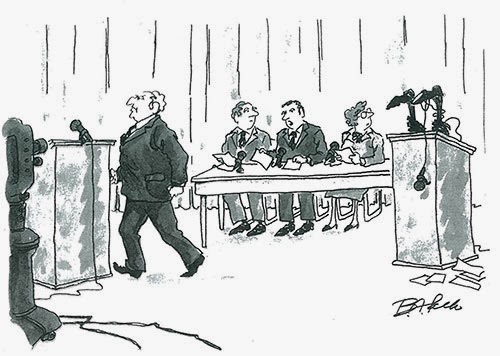 "A Reasonable Discussion On Sierra Madre's Water Situation." And what does this paper believe a "reasonable discussion" might be? Yet another article expressing the shopworn opinions of Sierra Madre's City Manager, Elaine Aguilar. Who apparently, and in the absence of any effective leadership from our current Mayor or most other elected officials, is currently the face of governmental authority in town. This would be the third such article by my count. Most of the Mountain Views News's coverage of the water rate increase here has consisted of quotes and interviews with Elaine Aguilar. A woman who, without even living here, appears to hold considerable power in this community. It is also important to note that throughout the six month buildup to these rather draconian rate increases not one single person opposing them was ever interviewed or quoted in this paper. An unfortunate situation when you consider that the MVN owes its marginal existence to the publication of City of Sierra Madre legal notices, which are funded by the taxpayer dollars of ALL the residents in town. This particular article is built around issues raised by a Sierra Madre resident named Eric Olson. Eric sent these topics and questions in an email to each of the members of the City Council. Who, I assume, then all passed them on to the City Manager. Which makes sense in a way. As we have already said, in that building Elaine wears the crown. Eric's e-mailed remarks and questions can be seen on the SierraMadreNews.net website, which you may access by clicking here. The MVN article that cites them, alongside the City Manager's comments, can be found here. Please note that in this article's introduction the paper's publisher, H. Susan Henderson, credits the need for raising water rates in Sierra Madre to the lack of rain. Something that is not exactly true. No one wants their water bill to go up. On the other hand, everyone knows that the covenants we gave in connection with our water bonds are hopelessly in default and it is no surprise that our municipal credit rating stinks. We need to get our credit back. Why did the City Manager avoid this particular item while commenting on almost all of the others? Perhaps it is for the same reason this topic has been ducked by City Hall over the last six months. That being it is the mismanagement of the repayments on the 2003 bonds that has helped drive our Water Department so deeply into the red. By making interest only payments on this City's 2003 water bonds, an initial $6 million dollars in debt then ballooned to nearly $15 million. And only by raising water rates can the significant financial damage this disastrous mismanagement caused be remedied. Why this issue has for all intents and purposes been dodged by City Hall is problematic. That the City should be asking for a lot more money from its residents for water, and without completely leveling with them about this extremely significant matter, is not the way things are supposed to be done. My suspicion is that the reason why our local government agency has been hedging on this one is to protect the reputations of the City's deeply entrenched old boy's network. A group of aging past politicians who still exercise significant influence at City Hall. Their role in causing this financial crisis having been completely whitewashed by both City Hall and the weekly newspaper it controls. We are now at crunch time in the Prop 218 water rate increase protest. And while victory over this latest big cash grab by the City is within reach, it is a long reach. By my rough estimate we are still somewhere between 500 and 600 ballots short of sending this deceptive mess back to the City Council for another look. If the protest prevails, hopefully we will then finally get an accounting regarding the activities of the good old boys responsible, and find out why they thought making a decade and a half of interest only payments on millions of dollars in bond debt was such a brilliant idea, or ever used the money to fix the pipes. You have just today and tomorrow to fill out your Prop 218 ballot and get it in to City Hall. Do it. Don't be a sucker. The deadline to submit a Prop 218 water rate increase protest ballot is this coming Tuesday. You can even turn it in during that evening's City Council meeting. Talk about life on the edge. You can still bring it down to City Hall tomorrow or Tuesday should you wish. Just be aware that they won't be overly anxious to help you before 11AM. They do have other priorities before then, you know. The actual ballot is located at the bottom of this page. You can print it out, fill in the information, and perhaps spare yourself rate increases of 61% for water and 100% for using the sewers. Oh, and don't forget to put your ballot in an envelope. I am not sure why, but I have been told it is important that you do so. I guess that way it can be opened on Tuesday. At this point we are a little bit behind the curve. Calls are being made by concerned volunteers all of this weekend, and the interested parties are being directed to the page I have reproduced below. My guess is that we have about 600 more ballots to go out of the approximately 1,800 needed, which at this late date is a lot. However, stranger things have happened in this town, and a big last minute surprise is not necessarily impossible. All you need too know to submit a Prop 218 Water Rate Protest Ballot is detailed below. Please read this information carefully. I believe we need to send these substantial water and sewer rate increases back to the City Council for a further review. I do not think a city government that has refused to level with us about the absurd levels of water bond debt we are now carrying deserves to be rewarded with even more of our money. Hopefully next time the City will finally understand that the people have a right to know who was responsible, and exactly what they were thinking when they created $9 million dollars in unnecessary additional debt by making a decade and a half of interest only payments on a $6 million dollar water bond. After all of these years, the truth finally needs to be heard. Help us make that happen. So-called Smart Growth advocates have an issue that really gets their undergarments into an unkind twist, and that is personal transportation. Yes, your car. Another is single family homes, but we can talk about that later. Let's just say for now that they have some control issues. The notion that you, the independent private citizen, should have the ability to whisk yourself about God's great creation pretty much free from the grasp of those who wish to save the world by putting folks into a little green box, and for your own good mind you, is upsetting to them. It drives Smarties kind of nuts, actually. Or maybe I should say it walks them kind of nuts. The problem is that like most high maintenance people they are a bit dangerous if ignored. And honestly, who would ever want to pay attention to them? Life is far too short to listen to people who think they'd be doing the world a favor by making you get out of your car and onto a bus. Or even force you to walk for that matter. The human race has been looking for easier ways to get around since the dawn of time. What is the point of reversing all of that now? Do you really want to bring back the goat cart? Especially when cars have never been cooler? Especially the emissions free electric ones? Besides, if walking is so good, why are we always the ones expected to do more of it? As far as I can tell the trust fund planning elite of Pasadena has hardly put itself on a Rusnak diet. Go check out the parking lot at Pasadena City Hall some fine day and you'll see exactly what I mean. Yes, I did take it as a compliment, thank you very much, when the L.A. Times last week followed up on a column I wrote a year ago about putting Pasadena’s main drag on a “street diet” by writing the same story and running it as the front-page centerpiece. It’s a fascinating idea, after all, and so counterintuitive that it tends to get folks riled up. Take lanes away from Colorado Boulevard, where the little old lady used to drive her super-stock Dodge? Slim down Route 66? Put in pop-up parklets in what were formerly precious parking spaces? Well, there goes the Rose Parade, one reader wrote in to us. Actually, the parklets can be moved, and the parade doesn’t need anything like six lanes — four traffic, two parking. And the next day a reader wrote to the Times about her worries for the future of our downtowns if traffic lanes are taken away: “everyone will be walking to avoid the resultant gridlock.” I could hear the shouts of “Yes!” from the likes of pedestrian advocate Jeff Speck (“The Walkable City”) from 3,000 miles away. Two points that cry out to be made. The first is something called the Assumption Of Leisure (AOL). Walking, or riding Southern California's rather inconvenient, and frankly edgy, public transportation systems, takes time. Lots and lots of it. Certainly it would be nice to be able to saunter about sampling interesting foods and coffees while gazing in awe at the many fine products being offered by shops along the way, but who in the world has that much time? Most of us have to work for a living, and unless people should suddenly develop a passion for getting up at 3AM, I don't see exactly how anyone is going to make it to their daily due on time. And what if you suddenly have to pick up your boss at the airport? You'd better start running now, working man. I suppose life in a desirable downtown walking utopia would be nice and all, but it is also rather expensive I've been told. To pay the kinds of rent needed to afford oneself of such a lifestyle takes a lot of wherewithal, and for most people that involves quite a few hours of toiling at the office. Trust me, you're going to need a car for that one. Here's the other thing. No parking means no shopping. And it's not like I'm talking about a boycott or anything. I've never enjoyed long and pointless stop lights quite as much as the ones I've waited for in Pasadena. It's just that if I want to take the family down to the Cheesecake Factory for something rich and filling, they're not going to be quite as enthusiastic about the idea if I tell them that because of the parking problems we're going to have to take the bus. We, the happy dinner party with money to burn, would just naturally want to decide on another option. One where we can make better use of our leisure time by driving ourselves. Chamber of Commerce, please take note. I guess my point here is that what Larry Wilson is advocating for here is something only available to a relatively small, and rather privileged, portion of our society. For the rest of us having to walk everywhere would be pretty much a return to stone age misery. MSN Real Estate has an interesting article up called 5 ways to fight the McMansion expansion. It is a thoughtful piece, and one that makes many useful points. You can read them for yourself if you click here. But what really piqued my jaded interest is the following comment, left there by someone who does not think highly of McMansions. Hubby: Honey, where are the kids I haven’t seen them since Tuesday of last week? Trophy wife: They’re in the playroom with the x-box, playstation, computer and ipod. I’ll text them. Hubby: Haven’t they been outside lately? Hubby: Should we take the Hybrid (Escalade) to McDonalds for a happy meal? We can get them another (crappy little plastic) toy (made in China). I’ll set up the DVD and playstation so we don’t have to hear the little brats screaming on the way there. Oh, have you seen my TaylorMade golf clubs? Trophy wife: Tomorrow I have to drive to the cleaners, the post office, the grocery store, the mall and the daycare. But, I can probably pick up a new set at the Sports Authority. You know, the new one right in between the PetSmart and the Bed Bath and Beyond. It’s just behind the Wal-mart and Home Depot. I hope I don't lose my Escalade Hybrid (that says "H Y B R I D" in 8" font down the side) in the giant sea of a parking lot. I’m so glad we got smart and went green. Hubby: I know, isn’t life great? I’m so glad we moved to Chipper Creek in this wonderful master planned neighborhood of Blandville Oaks. Everything I need is right here. Isn't America just grand? There has to be a middle ground around here somewhere. 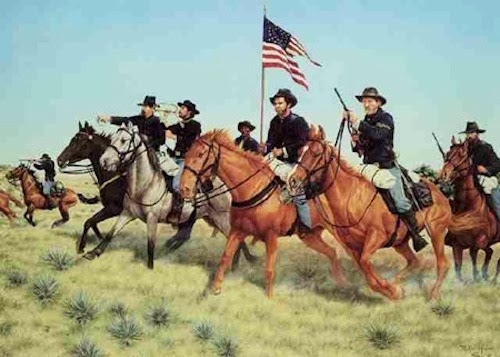 Prop 218: The Cavalry Is Coming! Proposition 218 is not an easy thing to understand. Theoretically you get to vote on whether you want to pay more for something like water, but you do not go into a voting booth like you would during a regular election. Instead you mail in a ballot if you don't support the rate hike, and you don't mail one in if you do. Does that make much sense to you? No, it probably doesn't. It doesn't make any sense to me, either. And frankly, I don't think that the people who designed this mess wanted it to. Would you believe that our very own Colantuono & Levin had a hand in it when this state law was first being worked out (link)? It certainly has some of those citizen unfriendly features our City's esteemed pay to play law firm is noted for. It is my belief that if this 61% water rate increase had been placed on a regular ballot during a normal election cycle, it would have not stood much of a chance of passing. Like with the UUT extension in 2012, the opposition to this increase would have been overwhelming. Sierra Madre is one of the most heavily taxed cities anywhere, and quite a few people here are simply fed up with the constant drumbeat for more and more of their money. So instead a far less democratic vehicle was chosen for the residents to struggle with, the one that City Hall believed would give them the best possible shot at prevailing. All done so that they could charge us far more for water and sewer services then they do now. Proposition 218 was not designed for easy resident victories, and so far it has been living up to its rather murky reputation. Fortunately, starting yesterday, and continuing through this Sunday, a hardy band of dedicated volunteers will be calling every resident in Sierra Madre and helping walk them through this very confusing Prop 218 process. And should you not be home when one of these hard working people calls you, they will try to get in touch with you two more times after that. This is designed to be a very thorough procedure, one with no rate payer being left behind. It truly is a sign of respect for the people of Sierra Madre, and once their work is finished every single rate payer in town will understand exactly what they need to do to best express their desires regarding this draconian water rate hike. Whether they want it to pass, or would instead prefer to send it back to the City Council for another look, all are going to know exactly what is involved. And with this coming Tuesday (Jan 28) being the deadline for getting protest ballots to City Hall, it all couldn't have come at a more fortunate time. When you get your call here is what to expect. You will be asked if you are a water paying customer, that being the person whose name appears on your City of Sierra Madre water bill. If so, you will then be asked if you have received a Prop 218 protest ballot from City Hall. If you do not have one the caller will tell you that you can go to city hall and request a ballot. There is also a website where you could be provided with a generic ballot as well. Under Prop 218 you theoretically could write your protest on the back of a cereal box, so a generic ballot will work just fine just as long as you supply your name, address, and water meter number. - 79% of the call recipients are favorable to the call. Meaning they are not upset about being called. - 71% of the call recipients identify themselves as property owners. - 81% of the call recipients state they have received the protest form. - 79% of the call recipients state they already mailed theirs in. - 36% of the call recipients request the website address so they can print a form out. - Overall a 34% Contact Rate, with callbacks to those not at home to follow. One figure that confused me just a little. If 79% have already sent their forms in, shouldn't we be well above 1,000 envelopes submitted by now? Unless, of course, they just mailed them in. I'd hate to think they might have somehow gotten lost. Keep your fingers crossed. The odds are still a little longer than I'd have hoped at this point, but the cavalry has indeed arrived. Head to the sounds of the battle. Since City Hall is closed today, you can download a Prop 218 protest form by clicking here. I will also be posting it tomorrow as big as life. Unintentionally hilarious article from one of the more arch so-called "transportation oriented smart growth" blogs around. Apparently SCAG is about to have its yearly job review with their Federal paymasters, and an obviously confused LASBO writer by the name of Dana Gabbard believes The Tattler is somehow going to dominate the proceedings. Perhaps Dana took in a little too much car exhaust on her bicycle commute to work? You can check this all out by clicking here. 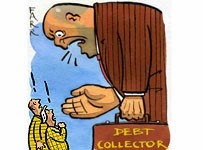 Is Moody's Investors Service Functioning As A Debt Collector Here In Sierra Madre? Rating Action: Moody's downgrades Sierra Madre (CA) water revenue bonds to Ba1 from A3; rating placed on review for further downgrade -- Moody's Investors Service has downgraded to Ba1 from A3 the City of Sierra Madre (CA) water enterprise's 1998 Revenue Bonds, of which there is currently about $3 million outstanding. The enterprise has an additional $8.1 million in outstanding debt not rated by Moody's but considered in our analysis, including $6.75 million Series 2003 parity bonds. The 1998 bonds are secured by a senior lien on the net revenues of the water enterprise. Concurrently, we have placed the rating under review for possible further downgrade, pending the outcome of Proposition 218 rate increase process scheduled for late January 2014. The downgrade primarily reflects significantly weakened operating results leading to continued rate covenant violation and rapidly declining reserves. The rating also incorporates a weak track record of implementing rate increases, the enterprise's moderately sized customer base with an above average socioeconomic profile, as well as aging infrastructure that requires significant improvements. Whether this was justified or not is a subjective judgement and largely depends on how you care to view these things. However, what does make it all rather suspect to me is the timing. What event could possibly be happening in Sierra Madre that made Moody's judgement upon our little mountain range of water bond debt a matter of such deep concern right this minute? The necessary clue is contained a little further down into the document. That's right, it's Sierra Madre's impending 61% water rate increase and the possibility that rate payers here might decide through the Prop 218 "process" that they don't especially care to pay it. If you gather together all of Sierra Madre's total water bond woes (both the 1998 and 2003 varieties), throw in all of the applicable interest and other costly considerations, you're talking about around $20 million dollars in hard debt that will eventually need to be paid off by our little town. Or approximately $1,820 for every man, woman and child living in our 3 square mile portion of paradise. An average of about $7,500 per household. Now we can talk forever about how the horrible mismanagement of our water company's financial affairs by certain elected officials in our near immediate past got us into this hot mess. It is a good conversation, and it does annoy the heck out of our largely third rate City Council. People who have steadfastly refused to share any such information with us. Most likely because they either figured it might distract us, or could embarrass their old boy cronies. Probably both. But what Moody's is concerned about the most here is whether or not the banks and other institutions holding our bond debt are going to ever get paid. And with our water company well on its way to bankruptcy, the only way that is going to happen is if we the targeted people are successfully dunned into digging even more deeply into our pockets and forking over the required cash. All of City Hall's disingenuous happy talk about infrastructure repairs aside, what we are seeing here is a classic municipal level bond debt collection operation in action. Sierra Madre owes a lot of money, and those holding the debt paper have become worried about if they're ever going to be able to collect on their investment. So naturally they shared their concerns with Moody's, who then called for the assistance of Sierra Madre's oftentimes duplicitous City Hall. And boy howdy were they eager to help. Should the Prop 218 protest fail (and honestly, things are not looking all that good right now), please be certain to remember all of this when you get your first $300+ water bill in a couple of months. Because despite what you might have heard from all of the usual suspects, all you'll really be doing is helping pay off old bond debt, a lot of which was created without ever bothering to get your approval. The bill collectors at Moody's would have it no other way. In case you are wondering where SCAG, Chris Holden, Hasan Ikhrata, John Buchanan and his candidates, SB375, SB1, AB32, the process oriented majority faction on our City Council, a couple of gullible EENERS, and the vast slough of pay to play corruption that passes for our state capitol in Sacramento are all leading us, you need to check this out. 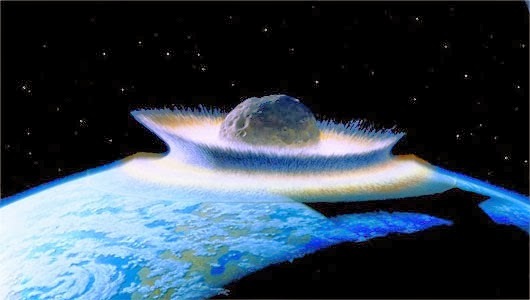 Northern California, perhaps due to its not always deserved reputation for succumbing to bogus world saving appeals, was targeted as the first portion of this state to experience the big Sacramento mandated "high density development will save the world from climate change" lie. In Marin County, where a lot of people have begun to see through this load of destructive nonsense, they're apparently up in arms about it. And some people have begun to get organized. This video, produced by an organization known as Citizen Marin, is called The Story of How Marin Was Ruined. You can view it by clicking here. An accompanying article from the excellent website New Geography can be accessed here. Mod: Yesterday we posted the "Rebuttal to the Argument Against Measure UUT," which will appear in the sample ballot mailer you will receive in a few weeks for this April's elections. Today we are sharing the comeback argument from those who are opposed to extending Sierra Madre's highest in the State of California utility taxes until the year 2022. Unlike the pro-UUT arguments, which were ostensibly written by 4 City Councilmembers, the arguments against extending our utility taxes were written by 3 private citizens, with two being CPAs. Their names are Cyndy Amerio, Michael Amerio and John Lewis. Proponents of this 25% UUT tax increase ignore a basic fact: City tax revenue continues to increase in all areas. Revenue increases vary - property values and new unit construction are increasing assessed (taxable) values. Sales tax revenue, however slight, is increasing. Utility tax revenue increased due to recent water, electric, and cable rate hikes. Scheduled water department overall increases of 19% and 18% (beginning February and July 2014) and 16% (July 2015), add significant UUT revenue that will help the City collect MORE monthly income at a 7% water UUT rate than it collected at 9% in 2013. SENIORS and others on fixed incomes will be especially hard hit with this UUT Tax increase. If a resident makes $1.00 more than the UUT low/moderate-income exemption limit, she bears the full brunt of the tax increase. The "yes" proponents' assertion that the scheduled rate sunset under the current law (established in 2008 and reaffirmed in 2012) will result in lower revenue is both inaccurate and deceptive. Measure UUT is designed to fool you into thinking that Public Safety is threatened by a "No" vote. Don't fall for it. Vote "NO" on Measure UUT. Mod: One thing you need to remember. The residents voted for 6% utility tax rates in 2012. Something that makes 2014's Measure UUT in reality a very substantial utility tax increase. Correct me if I am wrong, but the candidate from our most recent City Council election who best exemplifies what Gene Goss is condemning here is John Harabedian. Is that who Gene is planning to run against? What is interesting about the rebuttal statement we are posting here today is that while it's signed by Nancy Walsh and Josh Moran (both of whom are vacating our sinking ship), along with John Capoccia and John Harabedian, I am not certain that any of them actually wrote the final version. My guess is that the finished product, reproduced below, was probably the work of City Manager Elaine Aguilar. The wordiness of the document, along with a couple of instances where the author clearly plays fast and loose with the truth, seems in line with some of our City Manager's other efforts. This also fits in with a general pattern that we have discussed before. City Staff has become increasingly aggressive on taxation issues, with a majority on our City Council willing to simply rubber stamp most of their recommendations. Our assumption here is that much of the additional money being raised through the tax, fee and rate hikes put into place over the last few years is being used to offset increases in employee salaries, pensions and retirement benefits. In other words, staff is in effect writing their own ticket, and the current City Council seems willing to enable that. No matter how much it is going to cost the taxpayers, folks who apparently no longer have much in the way of elected representation on taxation matters. Measure UUT will maintain and cap the current 10% rate you are paying today. Measure UUT will also lower the current 9% rate for water and sewer to 6% in 2016. Measure UUT is designed to preserve the existing revenue stream so that current levels of service can continue to be provided to Sierra Madre's citizens. There are a couple of problems here. First, by capping the UUT at "the current 10% rate," Measure UUT will guarantee that Sierra Madreans, when all categories are combined, will continue to pay more in utility taxes than any other city in the State of California. A distinction that serves to underline just how absurdly high our utility taxes really are. Additionally, claiming by inference that the lowered utility tax rates for both water and sewer will result in our paying less money to City Hall is just plain false. The reason for this percentage adjustment is the impending 61% increase in water rates, plus 100% increase in sewer rates. To both raise these rates this radically, and then also rake in a revenue increase through the applicable utility taxes, was something even this City Council saw as being wrong. Which is why they lowered the utility tax rate for these two categories. Claiming this as a water and sewer utility tax cut is therefore disingenuous at best. 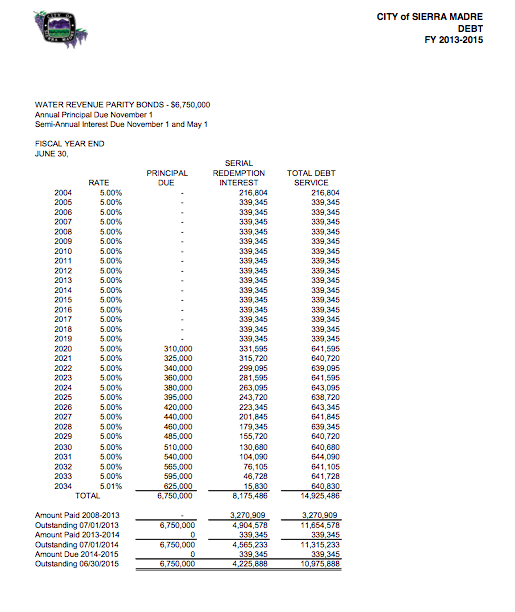 Property tax revenue will NOT replace the $1,000,000 in lost annual revenue if the UUT sunsets to 6%. On December 11, 2013 the State Board of Equalization declared that the inflation factor used to calculate property taxes for the upcoming year is 0.454%. Normally the maximum 2.0% inflation rate is applied, as was the case for the previous fiscal year. Thus, property tax revenue could be LESS than what was previously forecasted, despite the recent uptick in local property sales. Furthermore, $50,000 does not solve a $1,000,000 revenue shortfall. This is pure City Hall bunkum. That 0.454% figure is a statewide average calculation that tells us property taxes are going up, just like they do every year. So even if no properties at all were sold in Sierra Madre in 2013, a place where the value of our homes jump at a hearty pace year after year, property taxes are still increasing. It's just that for City Hall it is never enough. The City's unassigned General Fund Reserves are now at $282,000, not $870,000. In any case, unassigned reserves have been accumulating over years, and are the result of the City's prudent management of its financial resources. Reserves are accumulated and held to cover one-time projects, not to fund day-to-day operations. The reason why General Fund Reserves are now at $282,000, and not $870,000, is that our free and easy City Council very recently spent $588,000 of it on storm water issues, plus new roofing for City Hall, the Library and the building housing the Fire and Police Departments. It was only at the insistence of Councilmember Koerber that the balance of $282,000 was held back in case the UUT extension fails. Otherwise who knows what items on their long list the UUT4 would have spent it on. So much for reserves "that have been accumulating over years." If the UUT is allowed to sunset, Sierra Madre will lose over $1,000,000 per year in revenue for the General Fund, which pays for public safety, public facilities (including maintenance of trees, parks, streets and sidewalks), community services, and library services. It is not possible to maintain the current level of services with such drastic revenue reduction. Correct me if I am wrong, but wasn't the UUT increase the voters approved in 2008 supposed to be used to help fund safety services such as Police, Fire and Paramedics exclusively? Since when did the use of this revenue get expanded to include things like sidewalks and trees? Was there a ballot initiative somewhere that I slept through? Measure U: "Shall an Ordinance be adopted increasing the City's existing Utility Users' Tax by up to 6% in order to maintain general City services such as public safety services, including police and paramedic programs, and to reflect technological advances in communications, expand existing exemptions to low and very low income households, and establish a citizen's oversight committee?" I think some legal clarification might be in order here. Tomorrow we will discuss the rebuttal to the arguments favoring Measure UUT. Who Do You Trust More For Water Rate Information? The Mountain Views News Or A Robocaller? Perhaps Mayor Walsh never saw this report? H. Susan Poole-Henderson Carter (etc. ), the erstwhile publisher of our adjudicated newspaper of record, The Mountain Views News, seems positively obsessed with the as yet unidentified robocallers that have been leaving messages around town lately regarding the City's draconian 61% water rate increases. Hardly an edition of that tiny pressrun titan of local canards hits the streets these days without at least one reference to those mysterious folks. Which is fine with me. It keeps H. Susan from involving herself in some of the other important issues facing this community, which is a good thing. She doesn't really understand too much about what is going on, and anything H. Susan might print would likely be comically erroneous. Bad information that would only serve to confuse some very nice people. Just for laughs on what for many of us is a day off from the salt mines, I thought I would run a fact check on what the robocallers have been saying versus the story H. Susan has been laying down in her only lightly published weekly newspaper. Or at least we think it might be hers. The Superior Court of Los Angeles County could have a somewhat different understanding (link). Here is a portentous portion of the pitter patter of little minds to be found in this weekend's edition of the Mountain Views News. Earlier the same day, Mayor Walsh, in her State of the City address before the Sierra Madre Kiwanis Club, also encouraged residents to support the increase. "Don't believe some dude on a robo call," said Walsh, referring to the recent rash of automated calls asking Sierra Madreans to reject the increase. To date, no one has been able to identify who is the sponsor of these calls which contain "misleading and inaccurate information" said the city manager Elaine Aguilar in an earlier conversation. Now I don't know about you, but if I were to see "the city manager Elaine Aguilar" and H. Susan Henderson (link) walking down the street and heading my way, I'd be certain to take my wallet out of my back trousers pocket and move it to a front one. And has Mayor Walsh admitted yet in public that she is not running for re-election in April? Even though the deadline for filing is now way past its freshness dating? A strange thing, that one. This is a public service message from Water For You. Many in Sierra Madre believe the water rate hike will fix the City's water service. It will not. The truth is most of the money will go to pay down almost $15 million dollars in old water bond debt from 2003. The city has paid interest only on this debt for many years. They are wasting our money by not pursuing other alternatives. The rate hike will not improve water service. The city needs to go back to the drawing board. Your water rates will increase 61% unless you send City Hall your ballot voting no. If you don't send it in, your vote is yes. If you don't have a ballot call the City at 355-7135. That is 355-7135. The deadline to submit your ballot is January 28. As a way of judging this informal contest in truth dissemination we have culled from City Hall's website a rather sobering report titled "City of Sierra Madre - Debt Administration FY 2013-2015." You can find it there under that name. All you need to do is figure out how. The City's website can be a bit of a pill at times. For your reviewing ease, we have pulled out the page that deals with the 2003 water bonds and its many millions in vanity debt and pasted it above. And by looking it over you can see that yes, the City of Sierra Madre's waterless water department has indeed been paying interest only on that particular bond since 2004. In the process accumulating a massive amount of the kinds of unnecessary debt you create by making interest only payments on things. All caused by the dudes (Nancy Walsh terminology) responsible for the City's financial idiocy ten years or so back. I'm afraid beating H. Susan Henderson in a veracity contest isn't all that much of a feat. Susan's low impact humbugging being something that most anyone should be able to see through, and with only the most minimal amount of effort. That said, and based on the City's own bond debt data as evidence, the score is now Robocallers 1, Mountain Views News 0. The robocallers, whoever they may be, should be quite proud of their accomplishment. 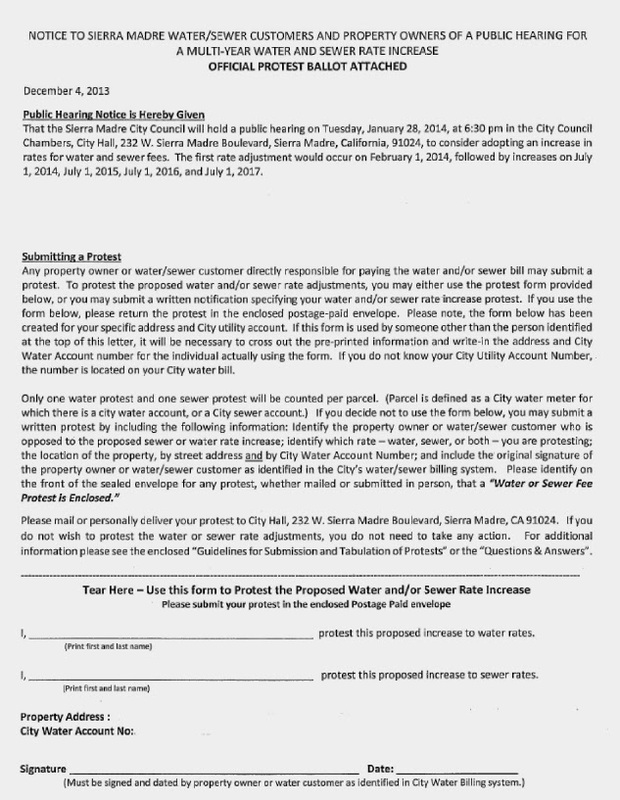 Be sure to send in your Prop 218 ballot protesting the water rate increase by January 28. It will annoy all of the right people. Mod: Here is a troubling little article for you to spend a slice of your Sunday with. As a Tattler reader you are clearly aware that the real issue driving the extension of our highest in California utility taxes until the year 2022 is the perceived need to fund City employee pensions. For some bizarre reason our town, with its population of less than 11,000, is expected by certain elected officials to fund City of Los Angeles style compensation packages, which is the reason why our UUT rates are so absurdly high. 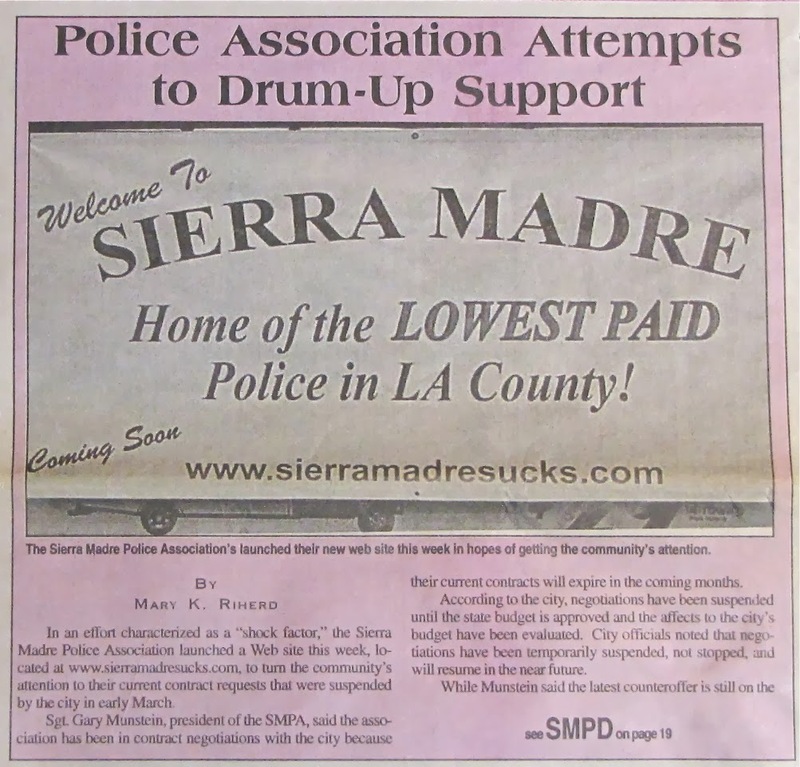 While there is an entire culture of denial about this matter in town, no plausible explanation to the contrary is ever offered … This article, which was prepared by Reuters for worldwide distribution, specifically mentions the law firm of Lackie, Dammeier, McGill & Ethir, the folks who represented the Sierra Madre Police Officers Association during their successful 2008 labor action. And while that law firm recently collapsed under the weight of various corruption investigations (link), and therefore no longer officially represents the SMPOA, the question of their hardball tactics remains. My guess is that the SMPOA will see opposition to the passage of Measure UUT as a direct assault on their pensions, and therefore will fight hard against any attempt to defeat it. Will they go as far as some of the scenarios discussed in the following article? I guess we will just have to wait and see. Insight: Battle over police pensions in U.S. cities takes ugly turn (link): A drive by some American cities to cut costly police retirement benefits has led to an extraordinary face-off between local politicians and the law enforcement officers who work for them. In Costa Mesa, California, lawmaker Jim Righeimer says he was a target of intimidation because he sought to curb police pensions. In a lawsuit in November, Righeimer accused the Costa Mesa police union and a law firm that once represented them, of forcing him to undergo a sobriety test (he passed) after driving home from a bar in August 2012. That followed a call to 911 by private detective Chris Lanzillo, who worked for the police union and the law firm that represented it, according to the suit. Lanzillo is also named as a defendant, accused of following Righeimer home from the bar. Disputes such as these have intensified as Detroit and two California cities, Stockton and San Bernardino, have gone bankrupt in the past two years. Police pension costs were a major factor in the financial troubles facing all three. Now large cities, including San Jose and San Diego, say they have no choice but to alter pension agreements lest they end up in bankruptcy too. The suit by lawmaker Righeimer also said that an FBI raid of the law firm last October uncovered evidence that an electronic tracking device had been attached to the underside of the car driven by another lawmaker, Steve Mensinger, one of Righeimer's allies in the pension fight. "What we are alleging is a conspiracy to gather information against political opponents", said John Manly, a lawyer representing Righeimer and Mensinger. Calls to Lanzillo's lawyers went unanswered. Lanzillo is not listed in any public directory. The FBI confirmed that some of its agents were present at the raid, but referred all other questions to the Orange County district attorney, which applied for the search warrant. Robert Mestman, senior deputy district attorney, said: "I cannot comment. It is a pending investigation." The police union, the Costa Mesa Police Association, denies any knowledge of the purported tactics. It fired the law firm, Lackie, Dammeier, McGill & Ethir, after allegations of the harassment first surfaced. Several calls to the lawyer representing the firm, which is in the process of being wound down, went unanswered. For many city and county governments, police are by far their largest single cost. For example, in the California city of Desert Hot Springs, which is teetering on bankruptcy, 70 percent of the budget is spent on police salaries and pensions. "There was a time when no politician would dare to cut back on public safety, let alone their pensions," said David Harris, a law professor at the University of Pittsburgh and a specialist in police and police behavior. 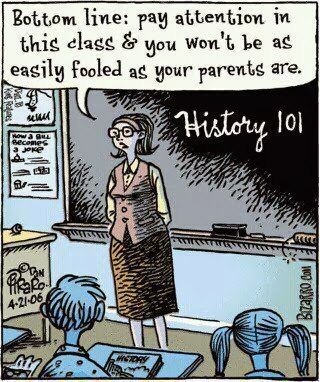 "Now we are in a different age." Police union officials claim there is a push by conservative political operatives to take away promised pensions from public servants who do a physically demanding and dangerous jobs, and that police officers are being forced to pay for officials' incompetent management of city finances. In Stockton, when then city manager Bob Deis warned in 2011 that police layoffs might be necessary, the police union bought the house next to his and immediately began noisy renovations. "It's like being a party in a law case and the other side buys the house next to yours," said Deis, who retired late last year. He and his wife sued with allegations of intimidation, in a case that has since been settled. The noise has stopped and the police union has agreed to sell the house within two years. The police union had also erected a giant billboard welcoming visitors to the "2nd most dangerous city in California" with Deis's phone number on it. The billboard has been taken down. Kathryn Nance, president of the Stockton Police Officers' Association, denied that the union ever tried to intimidate Deis. "Obviously that is his opinion," Nance said. "His allegation is ridiculous, at best." There also have been allegations of intimidation by police in Cranston, Rhode Island. On January 9, Cranston Mayor Allan Fung announced that state police will take over an investigation into a flurry of parking tickets issued in the wards of two council members. The pair claim the tickets were issued as retribution after they voted against a new contract for police that would have given them a pay raise. Fung announced that Police Chief Marco Palombo Jr. had been placed on administrative leave while the Rhode Island state police investigate the parking ticket allegations. Fung said "new allegations" had emerged about the conduct of police that was troubling, and that a number of police officers are under suspicion of misconduct. "The Cranston police were definitely sending us a message," said Paul H. Archetto, one of the councilmen. "It's intimidation and an abuse of power." Major Robert Ryan, a spokesman for the Cranston Police Department, said: "The matter is under investigation, and pursuant to law enforcement's bill of rights, no-one is going to comment on this." Ryan said the police chief was unavailable for comment. Police union leaders say their members are being victimized by some local politicians. "They are using scare tactics by telling the public that cities are going broke because of public pensions," said Chuck Canterbury, the national president of the Fraternal Order of Police, which represents more than 325,000 officers. "Most police officers contributed every month to their pensions. The cities in trouble did not do the same," Canterbury said. "When the economy got bad and the investment returns did not live up to the standard, all of a sudden they say it was the unions that got greedy." Ron DeLord, a former Texas policeman and consultant to police unions in the United States and abroad said the view of many rank-and-file officers is that they are up against forces who do not wish to negotiate. In 2008 DeLord told officers in American Police Beat Magazine to "get dirty and fight to win," by getting personal with reformist council members and to "bloody their noses." DeLord told Reuters last month that he had learnt to be more collaborative since 2008, but said of the "get dirty" message: "I wrote it. I believe it." 2. Does she know that Tanaka has stated that Baca told him to run the jails and that Baca was responsible for the abuse and corruption; and that Tanaka stated that "If your boss tells you to do something, you do it." ? What about ethical behavior and not doing something that is unethical, Mayor? 3. Does she realize that as Mayor of a city which has its own Police Department, she has no reason to offer her opinion on Tanaka, unlike the Mayors of Temple City and Rosemead who employ the Sheriff to patrol their cities, who have endorsed Tanaka? 4. Does she realize that the citizens of Sierra Madre may not feel the same as she does about endorsing Tanaka or any other candidate and that she should keep her endorsement on a personal level and not in an official capacity as Mayor? 5. Finally, does she realize that the position that Tanaka is seeking as Sheriff is significantly different from being mayor/city council member of the City of Gardena? There is no comparison! However, both are political! Problems at the Sheriff's Department will outlive Baca's tenure - The shock of Los Angeles County Sheriff Lee Baca's resignation is fading and the jockeying among his would-be successors is ramping up. Two of Baca's assistant sheriffs, a trio of high-ranking retirees and several current and former LAPD officers are considering throwing their hats in the ring; some have already launched their campaigns. But it's naive to think that electing a new sheriff will remedy problems that have been building for decades. The institutionalized thuggery in the department began before Baca's tenure and will persist beyond his departure unless something fundamentally changes. Top-ranking insiders who accommodated that culture share responsibility for the department's failures and shortcomings. The county jail has been considered a cesspool since many of its current deputies were toddlers. A 1992 investigation found rampant abuse of inmates by guards and lax discipline by their commanders — the same problems found by a citizens' commission studying the jail in 2012. Beyond the lockups, tattooed, gang-like cliques of deputies — like the bunch that embarrassed the sheriff by brawling at a Christmas party a few years ago — have been part of the department's culture for more than 40 years, and cost the county millions of dollars in brutality claims. 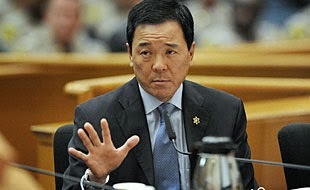 One of the men who'd like to succeed Baca, former Undersheriff Paul Tanaka, belonged to the most notorious clique when he was a sergeant in the 1980s at the scandal-plagued Lynwood station. That group, the Vikings, was labeled a "neo-Nazi white supremacist gang" by a federal judge. Last year, Tanaka retired from the department after the commission investigating the jails blamed him for promoting a culture of favoritism, aggression and misconduct. Last month, a federal probe led to brutality charges against 18 current and former deputies. The accusations include trying to intimidate an FBI agent and beating up not only inmates but jail visitors. Now Tanaka, Baca's right-hand man for years, is trashing his former boss and promising "new direction and leadership" if we elect him. Governor Brown Declares Drought State Of Emergency (link) - With California facing water shortfalls in the driest year in recorded state history, Governor Edmund G. Brown Jr. today proclaimed a State of Emergency and directed state officials to take all necessary actions to prepare for these drought conditions. In the State of Emergency declaration, Governor Brown directed state officials to assist farmers and communities that are economically impacted by dry conditions and to ensure the state can respond if Californians face drinking water shortages. The Governor also directed state agencies to use less water and hire more firefighters and initiated a greatly expanded water conservation public awareness campaign (details at http://www.saveourh2o.org). Blogger protected by 1st Amendment, appeals court says (L. A. Times link) - A federal appeals court unanimously overturned a defamation award against a blogger Friday, ruling that 1st Amendment protections for traditional news media extend to individuals posting on the Web. “The protections of the 1st Amendment do not turn on whether the defendant was a trained journalist, formally affiliated with traditional news entities,” Judge Andrew D. Hurwitz wrote for a three-judge panel of the U.S. 9th Circuit Court of Appeals. The panel said its holding was the first of its kind within the 9th Circuit but that other circuit courts already have extended protections for journalists to individual speakers. The case was brought by Obsidian Finance Group and one of its principals, Kevin D. Padrick. Writing on several websites she created, blogger Crystal Cox accused them of fraud, corruption and other misconduct. There are some taboo topics for City Hall in the Prop 218 conversation, and they have to do with a few of the core causes for their pumping water rates up by a lofty 61%. Raising these topics does seem to set some people off, and that can make for informative blogging. We do aim to keep things entertaining here as well. At the heart of everything financially ruinous for our town stands the 2003 Water Bonds. Originally sold to investors for $6 million dollars, through an extremely misguided policy of making interest only payments for a decade and a half that debt has now climbed to a frightening $15 million dollars. Something that had led to an impending financial ruin for this City's once proud water enterprise, along with degrading our Moody's water bond ratings to the level of junk (link). 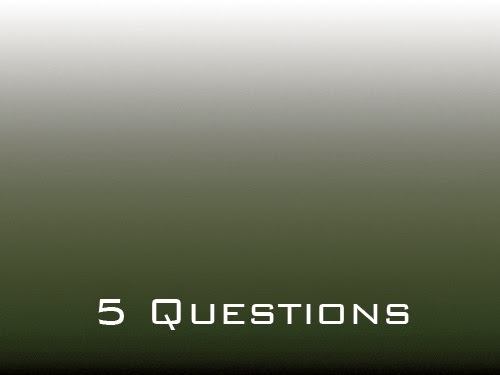 So we thought that today we would put together something we are calling "The Five Questions About Our 2003 Water Bonds That City Hall Won't Answer." Because let's face it, what could be more unconscionable than a City government asking for yet another water rate increase while at the same time refusing to answer some of the questions at the very heart of their need to do so? Of course, this does give us the opportunity to just keep asking these questions. Something that we are more than happy to do. It also allows us to continue urging people to send in their Prop 218 water rate protest forms to City Hall. At least until we get some answers. 1) Why did the City Council at the time the 2003 Water Bonds were sold commit us to something they must have known this City could not afford to pay back? Or, if not, where did they think that money would come from? 2) Why did the City decide to pay only the interest on the 2003 Water Bonds, knowing full well that doing so would require Sierra Madre's water rate payers to assume financial responsibility for an additional $9 million dollars in completely useless debt? 3) Why does City Hall refuse to in any way identify the elected officials who originally set us off on this financially ruinous course? Or discuss whatever their reasons were for doing so, even though those actions have today helped push our water enterprise to the brink of bankruptcy? 4) Why has the City refused to address the widely held misperception that these proposed water rate increases are to fund water infrastructure upgrades, rather than mainly servicing demands laid out by Moody's that we pay more for water in order to repair our junk level bond ratings? 5) Is increasing water rates 61% intended to refurbish Sierra Madre's junk level Moody's bond ratings so that the City can then sell more bonds? Potentially increasing the bond debt load this City is carrying to as much as $40 million dollars? So there you are. City Hall is closed today so we won't be getting our answers right away. Maybe they'll be ready for us early next week. I'll let you know if that ever happens. Political ‘silly season’ in Sierra Madre - Prop 218 protest votes growing with the deadline Jan. 28: Our friends over at the Tattler bring up a good point in a post Tuesday with a great headline: “Where Have All The Flowers Gone? The Civility Party, Once the Hope of Many, Is Now No More.”It seems that everyone is either leaving council, has left or is planning to do so. Nancy Walsh apparently did not file by Monday’s deadline, although we received no formal announcement from her or Josh Moran. As the Tattler says…..“They’re all gone. Not a one of them is left for us to marvel at their decorum and civil ways. The Civility Party, the three 2010 Sierra Madre candidates for City Council who won feverish acclaim as those who would restore our community to something it probably never really was, all of them have now gone away. Has there ever been a Mayor anywhere in this troubled old world who decided to leave office and didn’t bother to tell anyone? Nancy Walsh, who never drew the papers necessary to run for a second term of office, became ineligible to seek reelection after yesterday’s 5PM deadline for incumbents. She didn’t issue any public statements or press releases about this momentous decision, no condolences were given to her disappointed followers, no speeches were made, no dinners held, nor did she speak to the news media about why exactly she has chosen to so abruptly end her career in politics. Hopefully Nancy Walsh's unusual departure will finally be explained in this weekend's Mountain Views News. Most likely in an article written by one of the few people she actually speaks to, Susan Henderson. Until then we'll just have to wonder what Sierra Madre did to be treated with such cold indifference and disrespect.